Hamish Steele is a freelance animation director and illustrator who grew up in Somerset surrounded by legends, myths and folktales. Since graduating from Kingston University in 2013, Hamish has worked for the BBC, Cartoon Network, Disney, Nickelodeon, among others. Hamish currently lives in London. "Steele’s playful, cartoonish style and beautiful colors create a world that will get you instantly hooked. The character designs are refreshing and Barney in particular is a delight; it’s great to see a trans masc character not on the hypermasculine end of the gender spectrum and not drawn as perfectly passing at all times. "—Paste Magazine, "The 20 Best Kids Comics of 2018"
"This quirky, heartwarming adventure by Steele (Pantheon) captures the awkwardness of early adulthood and the idiosyncrasies of power-hungry demons. 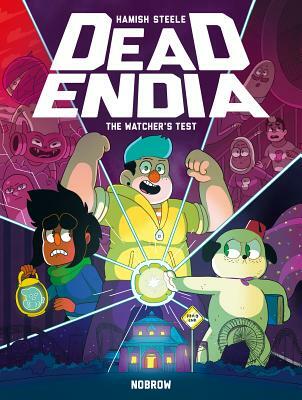 [...] A Steven Universe–like aesthetic and a full palette of bold, contrasting colors grace a diverse cast of characters"
"DeadEndia is an engaging, entertaining saga with memorable characters, and it works wonderfully as comedy, drama, and romance."